Before I had Cannon everyone would say 'wear your heels now, you won't wear them after he's born'. They were wrong. Granted, I don't wear them to the park or to swim lessons or to the grocery store. But I still wear them. There is little that makes me feel better than a wonderful pair of shoes (although when I left Cannon at school today, watching him walk in, greet his friends and run to his teacher to say hi made me feel pretty wonderful!). 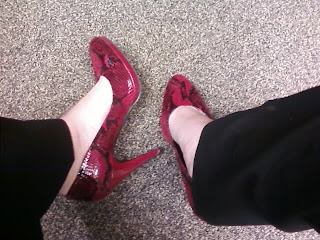 So today, with fall in the air, I pulled out houndstooth on top and red snake skin on the bottom. Call it flare, call it sass, call it a little bit of attitude. These shoes are the Best part today. Michael Phelps, I am not. A day in the life... of a ONE year old!